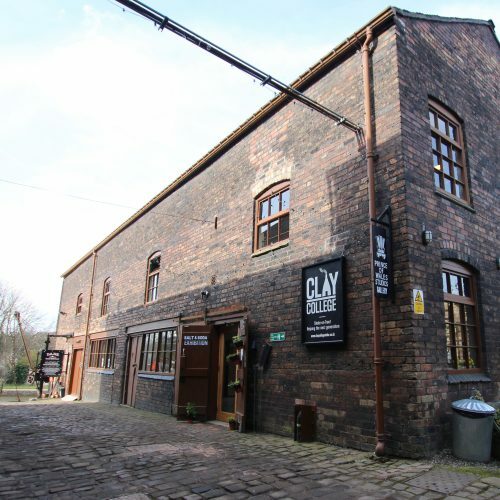 Clay College Stoke offers a skills-based, full-time ceramics course taught by potters who make a living through ceramics, something unique in the UK. 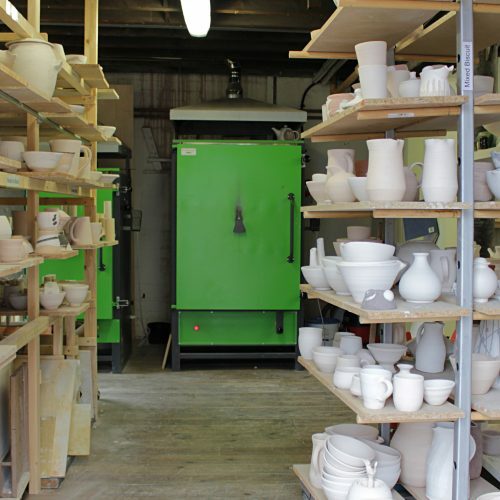 The Clay College Diploma offers 14 full-time students the opportunity to study intensively for 2 years and to learn from the best of national and international potters. The emphasis is on core skills and the use of materials. 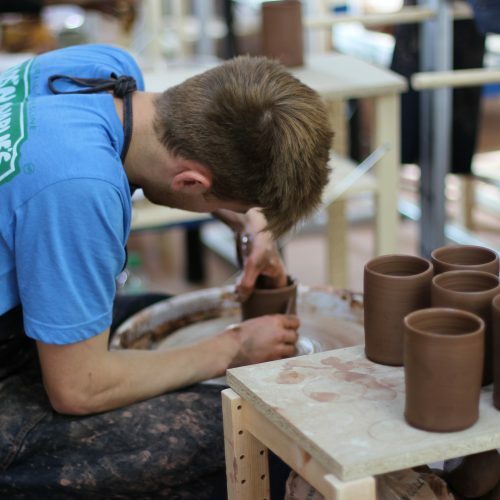 Students are taught all aspects of design, throwing, glazing, kiln building and firing, alongside traditional hand building and decoration techniques, augmented by modules focusing on business, selling, publicity and marketing. The Diploma offers students the opportunity to become self-sufficient makers. Alongside the course, we run evening classes, masterclasses, and lectures for the public, giving everyone the opportunity to learn from world-renowned master potters that come to the college to teach. 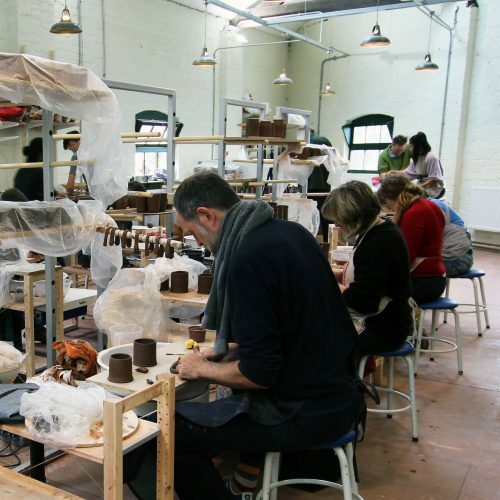 Clay College Stoke opened its doors on September 11th 2017, with a mission to teach practical pottery skills and design to an international standard and to create highly-skilled, self-sufficient and diverse makers. The college evolved from Adopt a Potter’s apprenticeship scheme, founded by potter Lisa Hammond MBE, to enable ceramic graduates to learn from successful professional potters, the technical and business skills necessary to become self-sufficient potters. Recognising that the focus in Higher Education had shifted from making and practical skills to concept and design, and the threat that this posed to the future of studio pottery, Lisa Hammond and Kevin Millward, a local designer and studio potter with 35 years teaching experience, resolved to set up Clay College to ensure that the skills and practical wisdom of a generation of Master Potters were not lost. Lisa, Kevin and the Trustees of Adopt a Potter set about raising the funds to set up the not for profit college and we are proud to say just 9 months later, in September 2017, the college opened its doors to 13 full-time students. The college was 90% funded by the pottery community; potters, ceramic suppliers, collectors, galleries and pottery associations, who all generously donated funds, equipment, time and pots. As an independent, UK registered charity, we do not receive any public funding, relying on tuition and course fees and support from individuals, trusts, foundations and companies to continue our work. If you would like to support Clay College and its future development, please consider how you can help us by buying from the gallery, signing up for a course, becoming a patron or supporting our ongoing fundraising for student bursaries, work within the local community and the artist in residence project.